Need to find a pet friendly hotel in Asheville? Click the Pet Friendly Accommodations Button below!" Asheville, North Carolina - A beautiful town amidst the mountains! 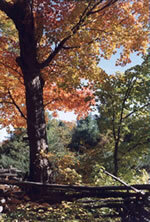 Pet Friendly Asheville lies nestled between the Blue Ridge Parkway. The nearby mountains rise up more than a mile in the sky offering every type of recreation from skiing to river rafting, fishing for a speckled trout or playing golf at over a dozen nearby courses. You and your pet can choose accommodations from luxury hotels to a log cabin. The sunrises and sunsets over the mountains alone are worth the trip to this special place. 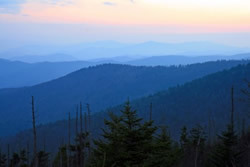 If you are a hiker or just like to linger at mountain overlooks along the Blue Ridge Parkway, bring your camera. Nature's majesty is inescapable. Asheville earned an international reputation as a premier health resort in the 1890s. By the 1920s, Asheville was a destination for the rich and famous, including F. Scott Fitzgerald, Thomas Edison and Henry Ford. 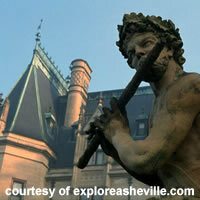 The premier attraction in Asheville is George Vanderbilt's 250-room Biltmore House. The grounds are incredible, especially in the spring and fall. But there is more to Asheville. This is a city steeped in history. Much of the architecture in downtown was constructed by the same craftspeople who built Biltmore House. Did you know that Asheville boasts more Art Deco architecture than any southeastern city other than Miami Beach? 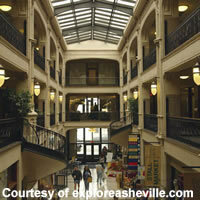 If you are a shopper, Asheville also has much to offer. With over 45 farmers markets in the region, fresh produce and artist's creations are readily available. The historic Grove Arcade building was restored and now serves as a shopping arcade featuring fine dining, art galleries, fresh produce and cheese stalls, and boutiques. Be sure and jump on the Blue Ridge Parkway while you are visiting Asheville. And more importantly, stop along the way and enjoy the wonderful sights and views. You will not soon forget this wonderful city nestled in mountains of North Carolina. Finding pet friendly hotels in Asheville is easy with PetTravel.com. Click the SEARCH PET FRIENDLY ACCOMMODATIONS button above for a list of pet friendly hotels, motels, bed and breakfasts, small inns, and vacation rentals in Asheville. You can even book your reservations on the same page! We have over 34,000 pet friendly accommodations in 5,000 cities around the world where you can take your dog or cat. Just fill in the box to the left and search our database. Traveling internationally with your pet? Look up pet immigration rules for over 147 countries and find the necessary forms by clicking on PET IMMIGRATION INFO under Directory on the left. Pet friendly airline rules can also be found in AIRLINE PET REGULATIONS. .
We even offer pet sitters in selected cities who will "petsit" your best friend while you go out to dinner in Asheville.